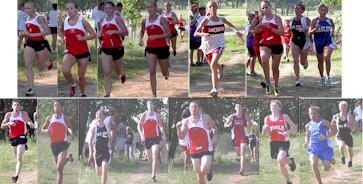 High School Girls 2500 meters (Team Results) -- Watonga 15; Weatherford 82; Hinton 94; Chisholm 96; Laverne 136; Little Axe 163; Lomega 168; Timberlake 193; Canton 213. High School Boys 4000 meters (Team Results) -- Watonga 28; Chisholm 60; Weatherford 74; Elk City 77; Little Axe 135; Laverne 161. 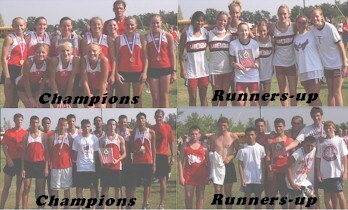 Middle School Girls 1738 meters (Team Results) -- Chisholm MS 51; Watonga MS 67; Hinton MS 106; Hydro MS 108; Elk City MS 125; Clancy 154; Lomega MS 165; Canton MS 170; Burns Flat MS 214. 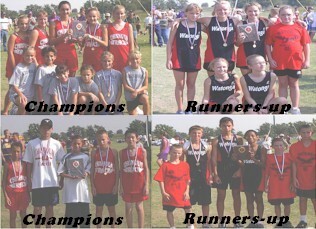 Middle School Boys 2500 meters (Team Results) -- Chisholm MS 40; Watonga MS 59; Clancy 61; Hydro MS 75; Hinton MS 135.